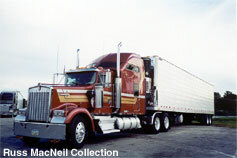 That program to take biometric information from hazmat truckers I mentioned earlier, isn't for Canadian drivers. It doesn't apply to them, however they have been working towards their own security card as well, and they are talking to the US to get Canadian drivers up to speed. Hazmat fingerprint rule doesn't include Canadian drivers - for now. Keep on truckin'... to the fingerprint site. As part of the USA Patriot Act Monday, truckers have begun getting fingerprinted and have criminal background checks performed on them. These are truckers who haul hazardous materials around the US, because those trucks could be used as weapons by terrorists. The problem affecting this project is that there are very few and far between fingerprint stations, and some truckers may have to make a detour. Hopefully that is just temporary. Fingerprinting of hazmat truckers begins. You've heard about the Registered Traveler Program right? - The one where they launched the pilot in 5 major airports to test the effectiveness of a quick way through security checkpoints for frequent flyers. Well it was supposed to end by now but it's still going strong. It's getting good reviews, and seems to be beneficial to the airport and the flyers. I know if I was a frequent flyer, I would have wanted to get in on that action too. Registered traveler program expedites airport screening with biometrics and smart cards. Looks like the US-VISIT Exit program is starting to bang on all 4 cyclinders. It was the last phase to be implemented, and after several months of 'checking out' at particular airports, they've added on a few more. Statistics to date: 407 criminals or immigration violators have been identified. 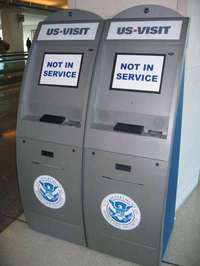 Department of Homeland Security to begin US-VISIT biometric exit pilot at Detroit metropolitan Wayne County Airport. The OLD US Secretary of Homeland Security said that we needed an international standard for biometric technology as it pertains to travel. Hasn't this already been said? Well, maybe not by him, but somewhere... and they're already making efforts towards that by way of their actions. Anyways, he's not gonna be around much longer. Judge Michael Chertoff is the most recent nomination by the President - we'll see if he actually qualifies this time. Wanted: international biometric technology standards -- Ridge. Well this is a warm article. All the things that ill-informed journalists have been tripping over lately really ARE seen in a positive light to the journalists who DO do their research. Enjoy a good read for once: Safer and freer in 2005. It's always about the standards. DHS is making an effort to get standards developed for their projects to work at an optimal performance level. With standards in place, it will be simple to share information, failure rates will be minimal, and teaching employees how to operate just one system becomes less stressful. That's just off the top of my head. I'm sure there are tons of other reasons for developing a standard. But anyways - DHS has become a member of The International Committee for Information Technology Standards. DHS puts its money on standards.